Last night we received an email from Canterbury (NZ) Museum. A donor had given them some artefacts and documents from a relative who had worked at the NZ Scott Base in Antarctica during 1973-74. They wanted more information about the relative and whether I could confirm he (the relative) had completed the first parachute jump at Scott Base. The museum had found me through the blog……. No…. Not this blog! It was my father who had been the NZ Officer in Charge (OIC) at Scott Base. He died several years ago and so I converted his diary of the 12 months he spent in Antarctica into a blog <blog link here>. My time in Antarctica was considerably shorter and a decade later. This morning the sun came out (for a couple of hours) and Waiouru started to warm up inside. It seemed like a good idea to try opening the houdini hatches for the first time. They appear to be very heavy; probably due to the double glazing and we have so much headroom in Waiouru that I was up on my toes attempting to raise the first hatch. That’s when I discovered the hatch will go well beyond the vertical position. It was only stopped by my small “pinkie” being caught between the securing bracket and the lip of the roof. All the weight of the houdini hatch cover was ever so slowly crushing the end of my little finger. The actual hatch was out of reach so I couldn’t pull it back to free myself. All I could say was “Oh dear.. I’m trapped and this is starting to really hurt. What shall I do?” “@#$%&*!… For @#$% sake….. 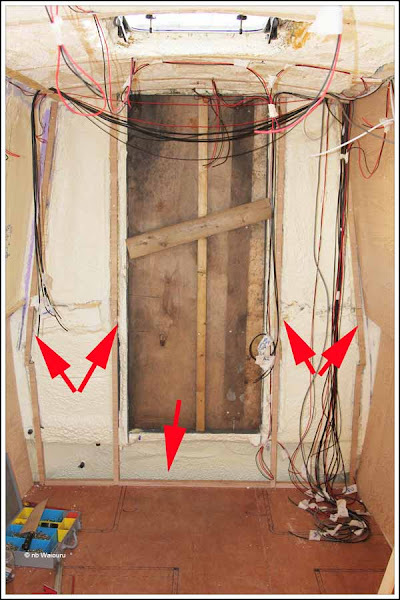 I need help PLEASE!” James realised my plight and lifted the hatch from the outside. I now have a royal finger…. The end is going blue! Richard and James commenced scribing and fitting the lining under the gunwale whilst I installed some 1” plywood to replace the missing battens on the forward bulkhead and around the rear hatch. All the original battens would have been removed when Ben Harp modified the foredeck. The technique is to drill pilot holes with a high speed steel bit and then use slightly larger shank wood screws. Provided your technique is good, the heads don’t snap off the screws. 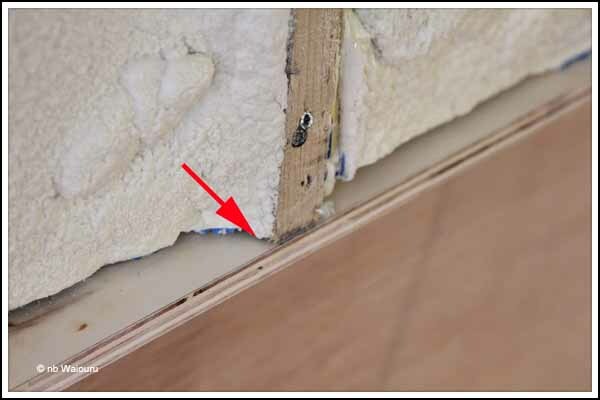 The missing battens in the back cabin were also replaced. 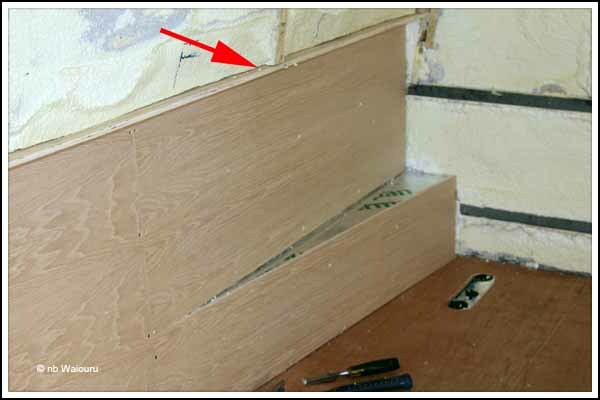 What Richard and James were successfully attempting to do was fix lengths of ½” ply under the gunwale as a capping. They wanted the ply level and with a straight edge flush with the face of the vertical battens. This edge will be used to secure the bottom of the lining that will clad the upper half of the side. Just to compound the complexity of the operation, Waiouru starts to narrow across the beam at the swim. 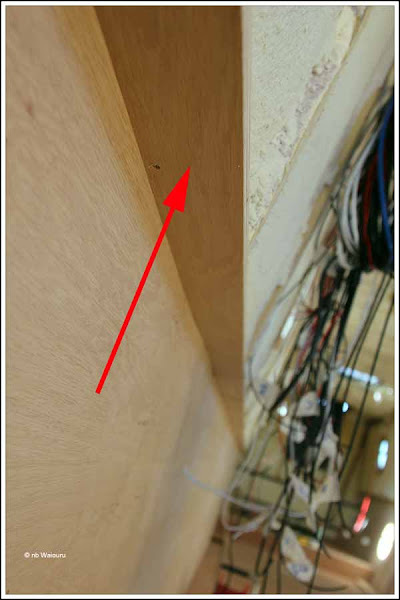 This required Richard and James to scribe the plywood in a curve under this area. Note the “Kingspan” insulation on top of the swim. I stuck it in place with the last of the spray foam. The last job for the day was to fit the first of the 12 sheets of plywood lining going above the gunwale. 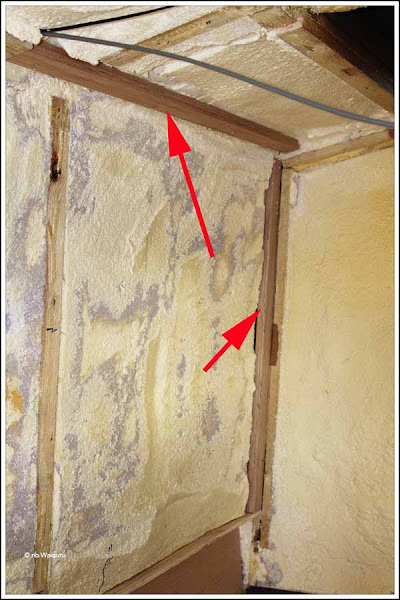 Their technique was to level the sheet along the bottom edge and then ensure the routered vertical end was perpendicular. 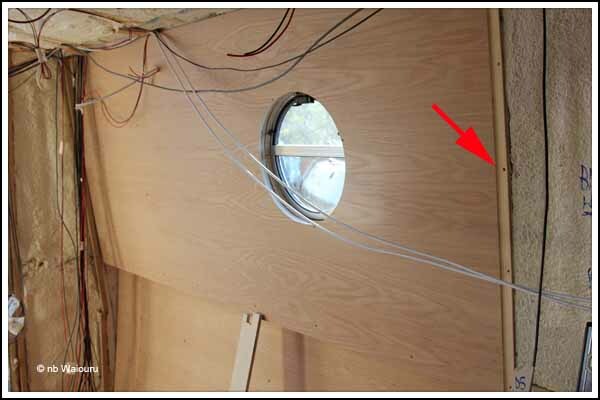 The sheet was temporarily screwed to the wall and the porthole removed from the outside of the boat. The outline of the porthole was then scribed on the reverse of the sheet. The sheet was then removed and the porthole opening cut out along with holes for any wiring. Finally, the sheet was refitted and screwed in place. It’s important the first sheet is exactly aligned as it will be the guide for all the remaining sheets on this side of the boat. Hopefully we will complete one side tomorrow. Nice to see things coming along. Keep up the level of description - I'm after all the hints abd tips I can get.